In our 2012 year in review post, we explained that, without surprise, spam levels were greatly on the rise. We are a bit beyond the halfway point of 2013 and wanted to post an update on what we’re currently seeing and to show just how true that ominous statement has turned out to be. We also wanted to share what we’re doing to combat the problem and how you can help. As you can see, successfully combatting over 100 million daily pieces of spam is the new normal. As general spam levels rise, so may the chance that some unwanted items will squeeze through our filters to hit your dashboard and comment queues. This is where we need you to ensure that you mark any such comments as spam so that they’re reported back to Akismet. This helps our software learn, evolve, and make better decisions moving forward. Because spammers evolve just as often. Let Akismet work its magic and correct it only when you need to. If you do, at any given time, experience a small influx of missed spam, there’s no need to become alarmed. Take a look at the number of comments that Akismet did successfully catch during that same timeframe and examine the accuracy rate (this will help determine whether or not there is a technical problem). Then, of course, mark the comments as spam so that Akismet can process the data. Do not place the comments in the trash — if you find something incredibly out of place, please feel free to get in touch. Finally, and most importantly, always remember that Akismet learns from user feedback via missed spam and false positive reports. This means that, when you see something that Akismet has flagged as spam, know that other bloggers have agreed with its opinion. Have you ever seen those advertisements that claim “9 out of 10 cats prefer this food!”? Well, when you notice a comment in your spam folder, think of it as “9 out of 10 bloggers say this is spam!” Don’t get fooled by the bad guys. In the meantime, our awesome (and growing) team will continue working magic behind the scenes and ensuring that Akismet is your best weapon against spam. One thing I have done to help reduce comment spam is to only allow comments on each new post for a certain amount of time. I have it set for 2 weeks presently. But Askimet always catches and puts it in que. I have only had one false positive in the last 2 years which I quickly noticed and allowed. Better to be marked then missed. 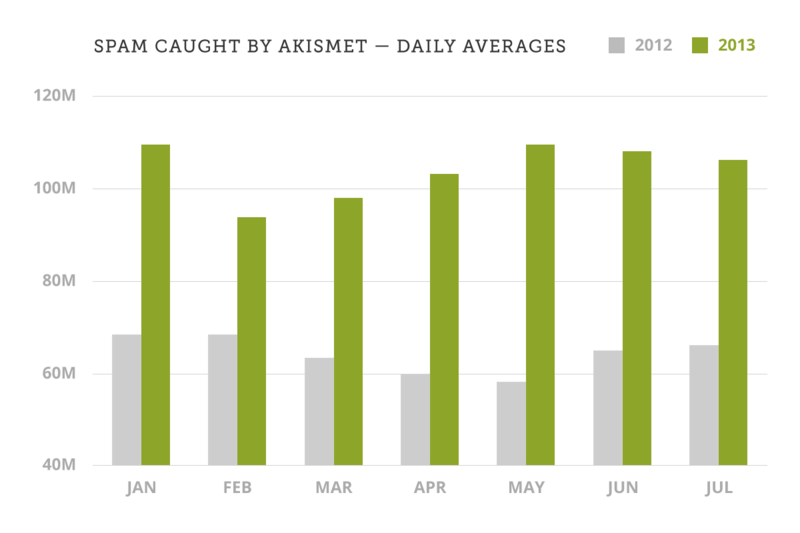 BUT is the percentage spam increasing or are there just a lot more calls to Akismet?